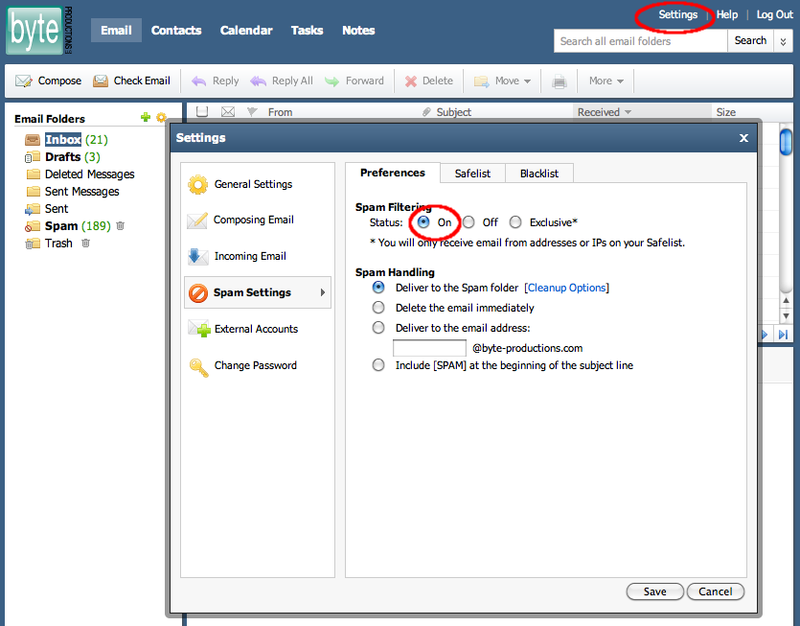 If your email is now set up with the new email system, you may notice a different amount of spam emails in your inbox. It is the policy at Byte Productions to not block any email destined for the end user, so the default spam policy is to have spam filtering turned off. This is something that you can control right in your webmail account if you would prefer to have the spam filter turned on. Use the email account you want to log into as your email in the email field, and the password we originally provided to you, or the password that you have since reset it to, in the password field. NOTE: You can use the above link to get to your webmail account at any time, instead of http://mail.yourdomain.com. Using the above link will ensure that the emails you send or receive are securely encrypted. Use this link if you must send, or are expecting to receive, secure, private information through your email. Once logged in, click the 'Settings' link at the top, and then the 'Spam Settings' tab. You should see the 'Spam Filtering' setting set to 'Off'. Change this to 'On' and then select the appropriate 'Spam Handling' option. If you select the last option of "Include [SPAM] in the subject," then all messages will be delivered to your inbox and you will have the option to filter the messages at your workstation with your installed email software. If you select the first option of "deliver to the spam folder," this filtering will happen for you on the server, and you will need to log in to webmail to check this folder if you suspect a message was accidentally marked as spam. If you are confident in the spam filter you can set this to "delete email immediately," but we would recommend waiting a few weeks to be certain.